The Philly Food Feed: Wow, What a Weekend!!! Wow, what a weekend for the Philly Food Feed! Sarah, Ben, and Ethan put some miles on the car (hyper-miles of course) visiting local food hot spots over this past weekend and now it’s time to share our experiences. Our pockets are lighter, our pantry and stomachs are full, and our hearts are overflowing with satisfaction. Not only did we make our usual stop at the Headhouse Farmers’ Market, we made two other local food related visits as well. And when we eventually did get to the Headhouse, we were joined by a cadre of newly indoctrinated local food enthusiasts. At this point you must be bursting with anticipation like a Hammonton, New Jersey Blueberry bursting with flavor. Corny? Yes, but as the mushroom says, I am a fungi! If you have made it this far, there is no reason not to read on. We here at the Philly Food Feed have been trying to expand our horizons. 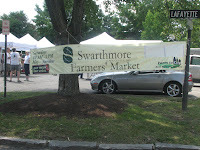 We wanted to start to branch out of the Philadelphia area and see what other parts of the Delaware Valley has to offer, so on Saturday morning after breakfast, we drove out to the Swarthmore Farmers’ Market in, you guessed it, Swarthmore Pennsylvania. Incidentally, this was not on a whim. 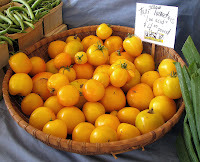 I have been checking out the Pennsylvania Buy Fresh Buy Local web site, entering in my zip code and finding all sorts of local food sites in my area. I have found this site vital in my locavorian pursuits (locavorian – not yet in Webster’s but we can get it in their folks). Take the time and check it out, you might be surprised to find a farmers’ market or natural food store or co-op right in your back yard. So off to Swarthmore we drove. When we arrived we found a quaint market with a cornucopia of locally grown and artisanal foods. Vendors we encountered included Pappardelle’s, provider of artisanal pasta. It turns out they have over 100 flavors of pasta ranging from Basil Garlic Fettuccine to Lime Cilantro Linguine. We had just been to Wegman’s and bought our allotted pasta for the week but next time we go back (probably next week), we will definitely be adding some of these intriguingly flavored pastas to our coffers. Among other vendors were Davidson’s Exotic Mushrooms, Beechwood Orchards (whom we recognize from the Headhouse), Sioux City Soaps, and of particular note, Big Sky Bread. I say of particular note because as I am writing this, I am chowing down on one of the chocolate chip cookies we purchased from this awesome find. When I tell you this cookie is obscene, I don’t do them justice. These are “last meal” type cookies. And here are the ingredients – Organic Whole Wheat, rolled oats, brown sugar, butter, egg, molasses, baking powder and salt. That’s it. Sounds like something Grand Mama used to make right? Tastes like it too. It’s like I can taste every individual ingredient as I am eating it. Rather than just eating a cookie, it’s more of an experience in your mouth, like the ingredients are dancing in a tango of taste on your tongue. You like that description? My wife did too. Big Sky is out of Wilmington Delaware, but you can find their products from West Chester to Newark to Kennett Square. Besides the cookies, we also bought a Mutlti-Grain bread which is delicious AND healthy. And the best part (especially for all you Omnivore’s Dilemma and Food Inc. people) NO PROCESSED SUGAR! NO CORN SYRUP!!! Needless to say, I am thrilled. All of this great food AND really friendly people to boot. I spoke with the owner, Mr. Patrick O’Neil. An amiable gentleman if there ever was one; he took the time to seek out and introduce me to Mr. Marty Spiegel, the coordinator of the market. Marty was intrigued by the Philly Food Feed and wanted us to spread the word about the market which we are happily obliging. This is certainly not the last trip we will be making to this market. Did I mention another reason to visit? 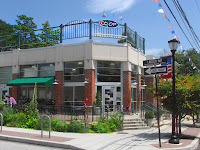 The market is directly across from the Swarthmore Co-op. While the co-op is community owned, anybody can shop there. It has been around since 1937 and was awarded as The Best of Philly in 2006. With those credentials it’s no wonder that the food there we saw all looked fresh and delectable. There were all sorts of locally grown produce and meats and fish that ran the gambit from conventional to organic to all natural. A little something for everybody. There was also a very nice woman doing a demonstration for Zukay salad dressing. All natural, no added sugars or hidden corn. We sampled a plethora of different flavors and the Philly Food Feed recommends you give these dressings a try. So that was Saturday - a fantastic day in Swarthmore. There is no doubt that we will be returning to this market and the co-op very soon. Now, a deep breath and on to Sunday! As is our custom, Sarah, Ethan, and I usually find ourselves at the Headhouse Farmers’ Market on Sunday mornings and this past Sunday was no exception. However, we were not alone. Joining us on our weekly visit was Philly Food Feed Alum Susan Anderson and her husband Henry and their children, my sister-in-law Emily and her husband Stu, and our new friends Dana and John and their daughter. What a crew! I have been singing the praises of the Headhouse for so long, our friends and family wanted to see what all the fuss was about. And from what they are telling me, nobody was disappointed! As always, we started at Blooming Glen Farm. Last time I was here I bought some Walla Walla Onions that were so sweet and good, they had to make a return engagement to our pantry. That picture makes you want to go vegan doesn’t it? We also bought lettuce, squash(for baby Ethan), and heirloom tomatoes. When the food looks like that, it makes you want to buy the whole stand! I also made sure we all stopped and said hello to Ben Wenk at the Three Springs Fruit Farm stand. There our clan picked up conventional peaches, white peaches, and white nectarines. I peeled and cut up one of those white nectarines for my oatmeal this morning and it was like eating candy. And since Three Fruit Farms grows the IPM way, you can feel good knowing that what you are eating is of the sustainable variety. There is something about that, you know? Eating something that is so delicious and knowing it wasn’t inundated with chemicals and that somebody really took the time to grow this so it can be healthy for you and your family. I cut up one of those peaches for baby Ethan’s breakfast this morning. Thanks Ben Wenk! 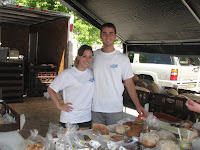 And thanks to all of the other local vendors that make healthy eating possible. The market has a different look to it, the past couple of weeks. In order to make more room, some of the vendors have moved their stands to the outside of the shambles. Considering the throngs of people that have been swarming to the market, it makes getting around a lot easier. Especially with a baby carriage, which in our party there were three. Thanks to the Food Trust and the Headhouse vendors for making access to the food all the more easier for us conscious eaters! 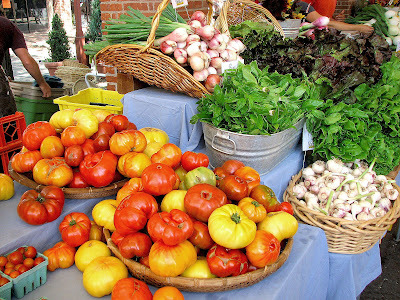 Before I end this long post, I wanted to mention that the Huffington Post, every liberal’s favorite blog, has been showcasing farmers’ markets all over the country recently and has asked those who frequent these markets to send in pictures of their favorites. With camera in hand, I was shooting candids all over the market on Saturday. Hopefully one will make it and give the Headhouse and the Food Trust all the publicity they deserve. On another note, LocalHarvest.org, the ultimate guide to all things sustainable, is running a contest in conjunction with Care2.com to find America’s favorite farmers’ market. The market with the most votes gets a $5000 prize! We at the Philly Food Feed can’t be partial, but we are posting a link on our page so you can show support for your favorite market. Who knows, with your help, your favorite market could walk away with five grand. That can buy a lot of peaches! Not only does that picture make me want to go vegan, but I'll do you one better. I'm planning a full vegan meal for you guys one day based on my Christina Cooks cookbook. I'll get all of the ingredients via the Farmers' Market scene and create a meal that will send your taste buds on a So You Think You Can Dance dancing spree. I can't wait. Once again I am inspired to live better and eat better from your wonderful blog. Keep it up Ben!!! What great pictures. 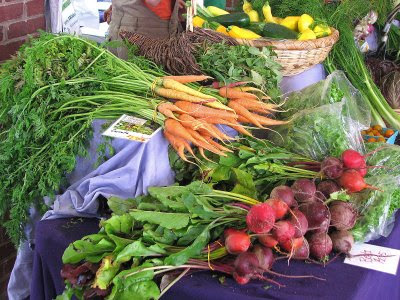 Your pictures will definitely get more people to go to farmers markets.